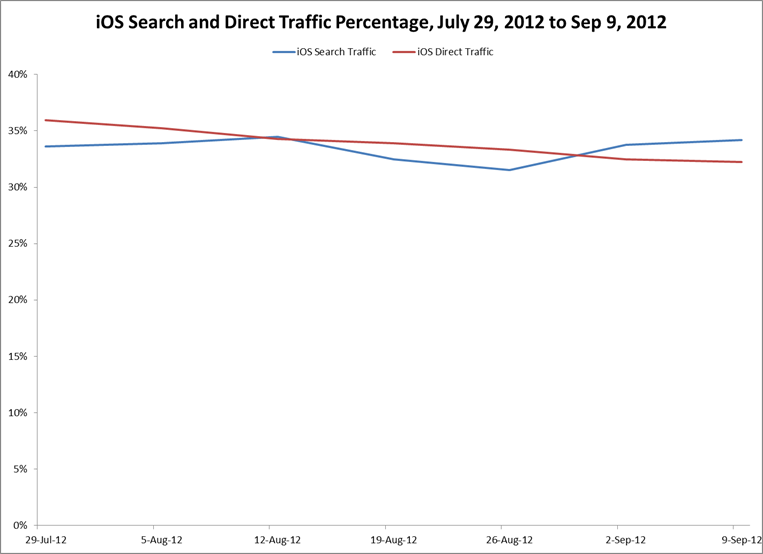 Hey Siri: Why Am I Losing 9% of My SEO Traffic from iOS? The web browser on iOS 6 switched to use SSL by default and our web servers don’t yet take that fact into account. Searching still works fine, but in some situations the HTTP referer header isn’t passed on to the destination page. We’re investigating different options to address this issue. Google’s not provided issue has been well documented, but that only concealed specific keywords and not attribution of traffic from search. 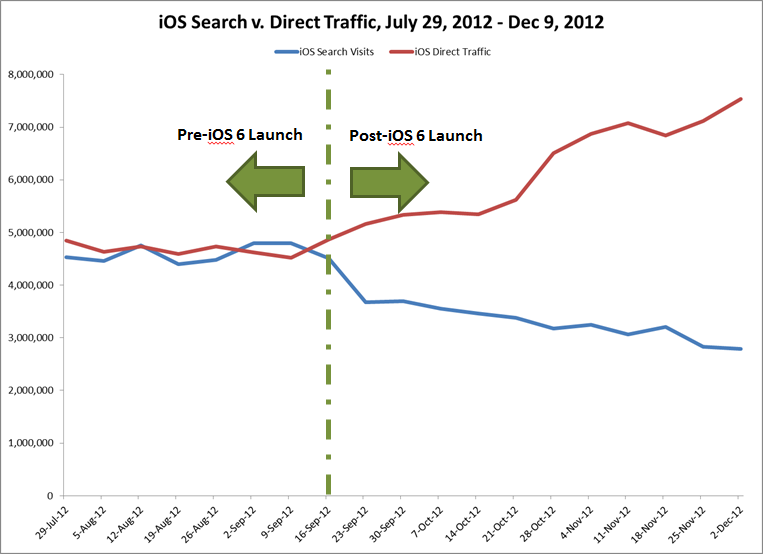 This iOS 6 issue, though smaller in scale, is more insidious, because a substantial amount of search traffic from iOS is now being reported as direct traffic (86% according to this article). If you are an SEO whose performance is directly correlated with search traffic performance (and frankly, who isn’t? ), then you need to understand and account for this issue. 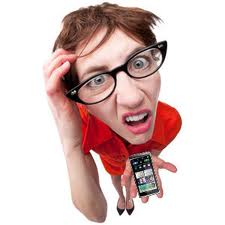 The true and full measure of the value you bring to those who pay you for your search expertise depends on it. UPDATE: See our follow-up post that describes how your Android 4 search traffic is also being lost – and what to do about it. Google released the statement above to Search Engine Land on September 27. 13 weeks later, no solution for the search referrer issue has been published, and iOS 6 usage continues to grow, both with the sales of new iPads and iPhones, and with users upgrading their older mobile devices with the new OS. Unless and until Google develops a solution for this, workarounds to re-bucket search from direct traffic need to be put in place. In the rest of this post, we’re going to quantify the impact on search traffic referrals to provide a sense of its scale (spoiler alert: it’s 9%), and then suggest a workaround to account for the attribution problem. To understand the scale of this problem, we looked at the iOS, search traffic, direct traffic and total visits data for a cross section of our clients across many verticals, including video, health, entertainment, lifestyle, fashion, ecommerce and news. In aggregate, the sites we looked at receive 83MM visits per week and include some of the most recognizable brands on the web. In aggregate (and prior to adjustments), weekly search referrals for these sites are 27MM/week, or 32.7% of all visits. 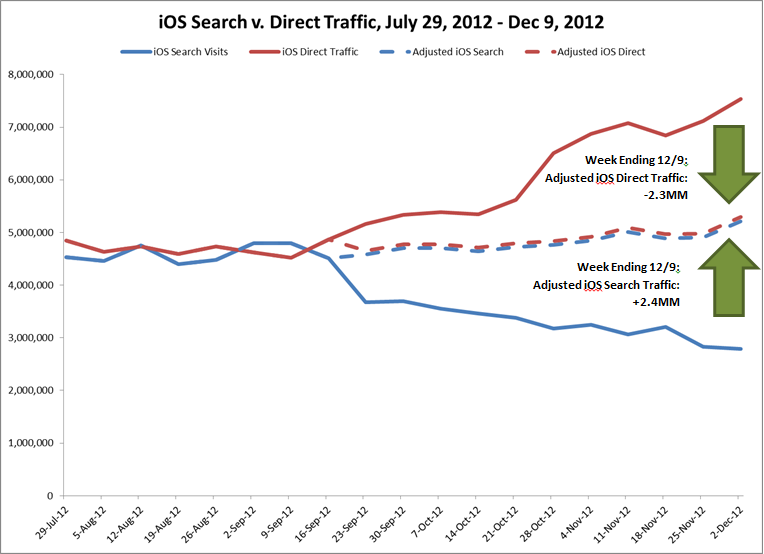 For the latest week in which we pulled data, reported search traffic via iOS was 2.8MM, vs. 7.6MM visits from direct. 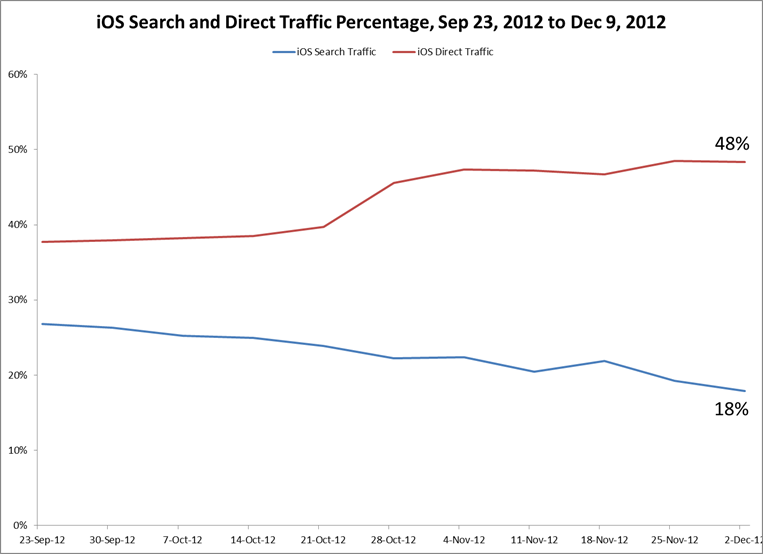 For the week ending December 9, the search and direct traffic referral numbers debited 2.4MM from the iOS search referral ledger, while incorrectly crediting iOS direct with 2.3MM referrers. Here’s how we arrived at that calculation. 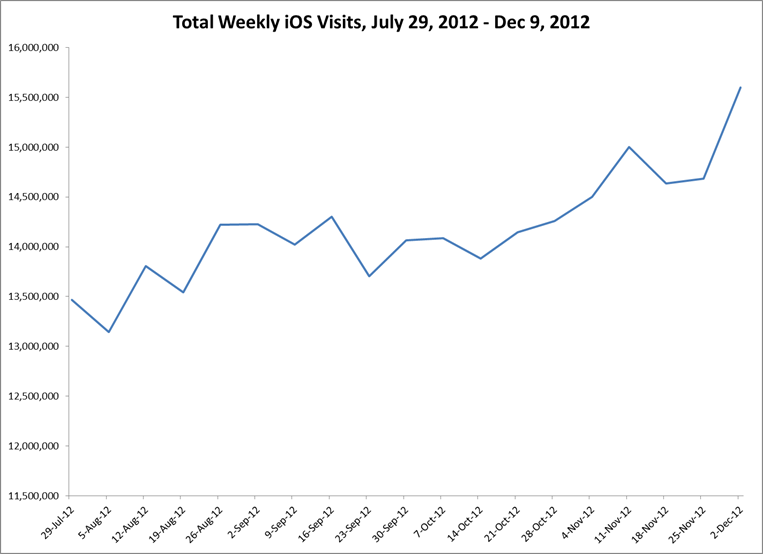 At 9% this iOS 6 obfuscation is materially impacting our clients’ search referrals – and likely yours too. And with no solution on the immediate horizon, this percentage is only going to grow. So get ahead of this issue now. Make it known to your clients and employers. Apply a calculation to get back the credit for the search traffic you’ve worked so hard to earn, using the methodology outlined above, another one published by the Rimm Kauffman Group or one you develop on your own. And do so before this issue balloons to a point where your client or key executives start to notice, leaving you to scramble and defend against a search loss that isn’t your fault. Shahzad is VP of Digital Media at Define Media Group. Through his expertise in search marketing, social media and web analytics, Shahzad helps Define clients increase traffic, engagement, conversions and revenue. 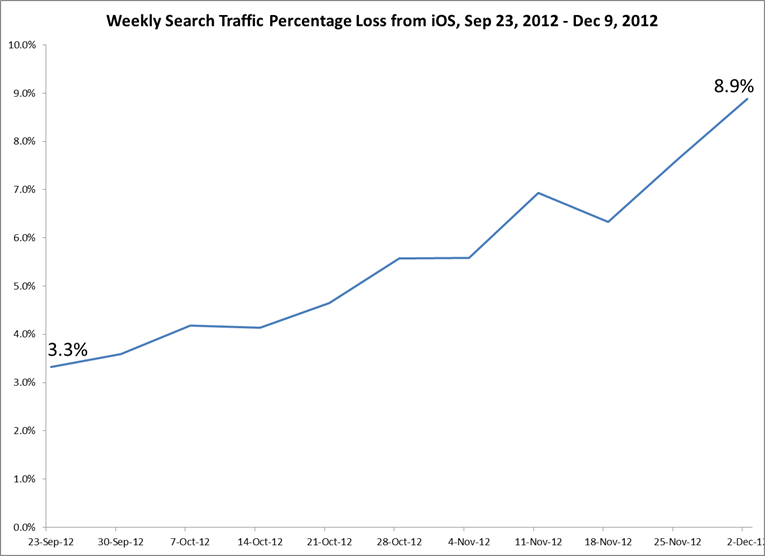 You’re Losing Android 4 Search Traffic. Here’s How to Get it Back.